I’ve made this buttercream icing for years, but I wasn’t vegan until 2015. Thankfully this recipe was easily adapted to non dairy and IMO tastes much better using plant based butter and milks. I started developing this recipe after many heavy, sometimes bland, and overly sweet tasting batches. I was making wedding cakes and needed a more consistent and stable icing to withstand travel, moderate heat and that tasted amazing. This icing is a heavy icing and really needs a stand mixer if making the large batch to get the proper whip and air for maximum fluffiness. Fifteen or more years ago, I burned through five electric hand-mixers in one year. To keep my sanity I no longer make wedding cakes, but after burning out my mixer mid wedding cake my husband ran out to pick up another. He surprised me a Kitchen Aid Stand mixer, WOW… what a difference. I still have and use that mixer which sits on my counter. I use it almost daily for some type of cooking assistance. 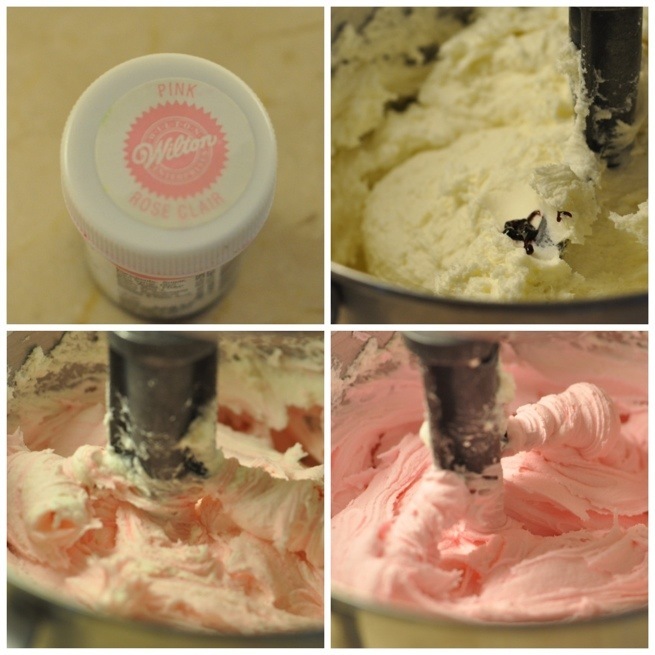 It saves much time and stress when making large batches of beautifully whipped icing. Add 1 pound (4 to 4 – 1/2 cups) of the powdered sugar/meringue powder or aquafaba and mix on low for 3 minutes. Leave the icing as is or add the food colouring of choice. I prefer to use Americolor gel food colours, I find that the high pigment content in them allows you to use less. Which means you get more for your money. Using a wooden pick to add a small drop at a time until I reach the desired color. Wrap icing in plastic wrap for easier clean up. 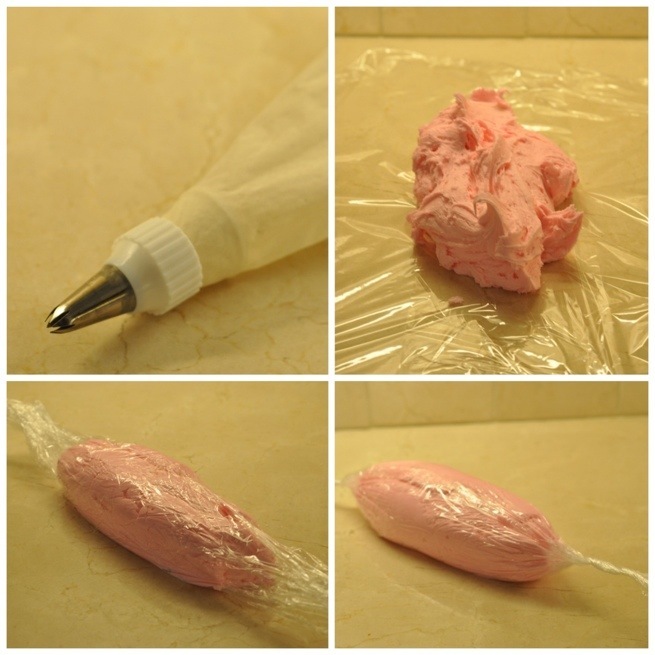 Lay out one or two sheets of plastic wrap, depending on the size of the icing/pastry bag you are using. Place a few cups of icing in the centre of the wrap. Twist the ends until tightly bound. When finished pull out empty wrap, discard and be happy clean up is much easier. Butter-cream Icing will last for weeks in the refrigerator, as long as it is well sealed. When ready to use again. Leave the icing at room temperature for 30 minutes to 1 hour. 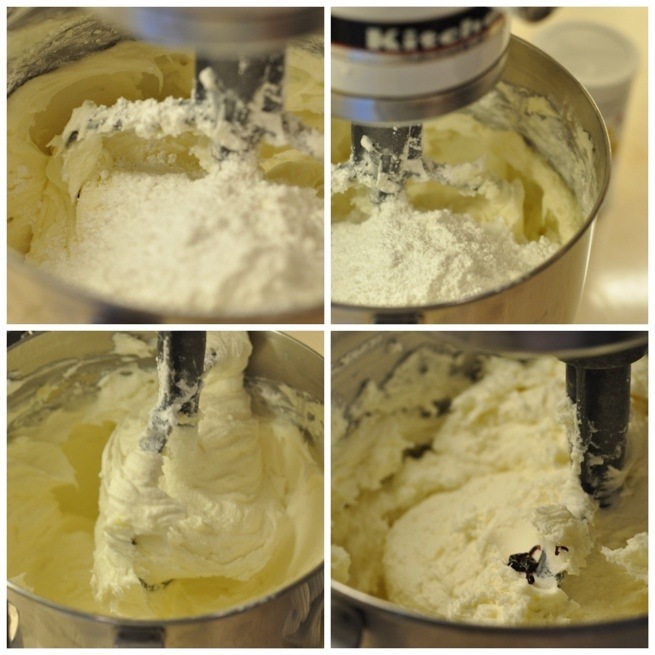 Add to a mixer or use a hand mixer to re-whip the icing to a smooth fluffy texture. 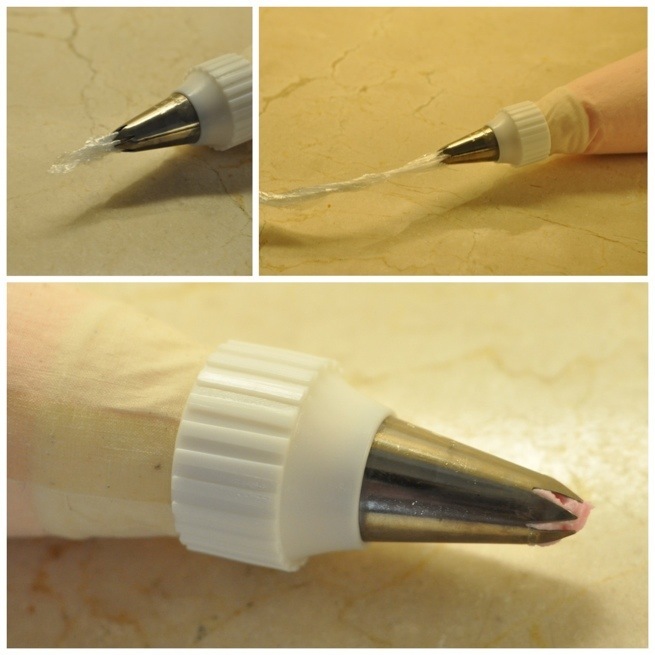 You can use this icing to make roses for drying but drying time is approximately 4 days depending on the humidity in your home/area. I usually use aquafaba or make my own vegan merinque powder but you can now purchase vegan meringue powder online. This recipe can still be made and will taste the same if you don’t have aquafaba or meringue powder. However, aquafaba or vegan merinque powder makes a fluffier icing and works as a stabilizer in this recipe. Hi! I’m doing a rosette cake and cupcakes for my daughter’s birthday. It starts at 3 pm and I’m planning to frost around 10am. After frosting, can I leave the cakes in the fridge first then bring it out just before 3? And if so, will the icing get ‘hard’ once I put it in the fridge? I’m afraid that once it get hard and brought to an air conditioned room (not as cold as fridge temp),it will get really soft at the end of the day and ruin the design. We will only be eating the cakes around 5pm, but I want to display it. No worries, that is fine. This frosting will only get really soft in hot situations like a hot sunny day outside by in direct sunlight, or if it was in a really super hot room you may have problems with the icing slumping or sliding off the cake. You will not have to worry about this in your situation. The icing does get hard when you put in the refrigerator because butter and shortening harden in cold temperatures. But just like when you leave a block of butter on the counter at normal room temperature for an hour or more it will soften back up, but not melt. Your design and rosettes should stay perfectly formed. I hope this answers your question.